With the Milan Fashion Week just about over as well, the designers seem to have made the jump from the 1970s looks to the 1980s, perhaps hinting at the new decade being the 2016 source of inspiration? 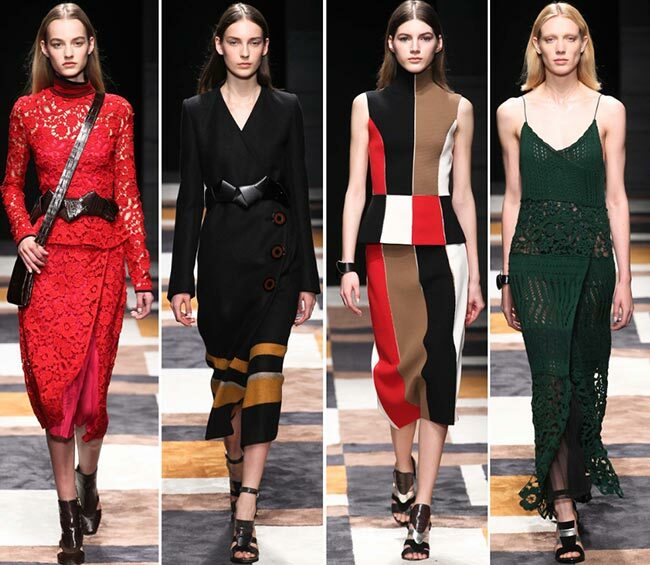 The pieces presented from the Salvatore Ferragamo fall/winter 2015-2016 collection are beyond superb, quite perfect for the fall and winter seasons and so beautifully colorful towards the end, picking up on all the right hues to pull together their abstracts works of art. 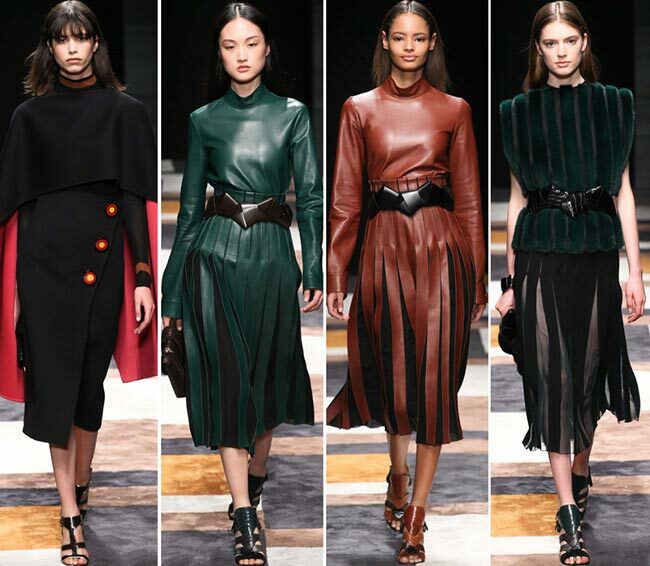 There was a nice tice of bourgeois polish to the works by Massimiliano Giornetti, with classic shapes in lean and long-sleeved dresses sticking it nicely, complete with turtlenecks and high waist pleated skirts. They were conservative and covered up the silhouette underneath perfectly, though they can be called anything but plain. The decorations along the collection included circular buttons in brown and black and yellow and red that somehow reminds us of fast food chains more so than a high end world renowned fashion house, detracting from the more sophisticated looks but not enough for us to forsake our love for the collection all together. On the contrary, we have easily been able to push those pieces aside or have made plans to replace them with buttons in colors that might be a little more suited to our tastes. Horizontally knit tabard capes look pretty good among the mix, adding an air of elegant confidence to the silhouette presented. We can even learn to love the slinky bounce to the skirts as that adds some fun to the mature pieces. 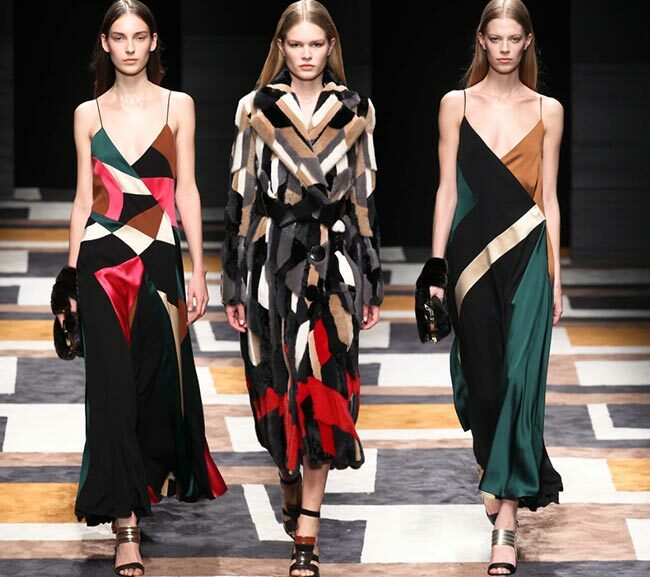 The final few pieces of the Salvatore Ferragamo fall/winter 2015-2016 collection show off Giornetti’s power to dissect delineate and define the boundaries of the collections shown on the Milan Fashion Week catwalk. 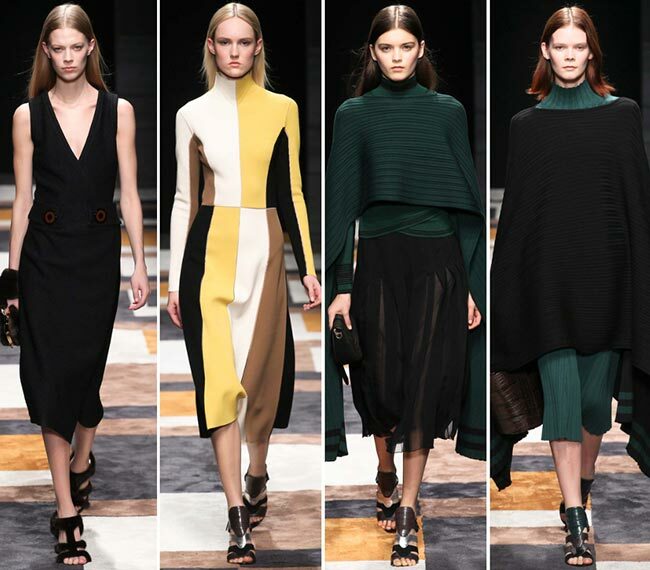 We see the familiar color blocking knitwear in the autumn hues, the use of widths and stripes to create new dimensions, the use of monochromic colors in pleats and tweed skirts, as well as the fur outerwear. 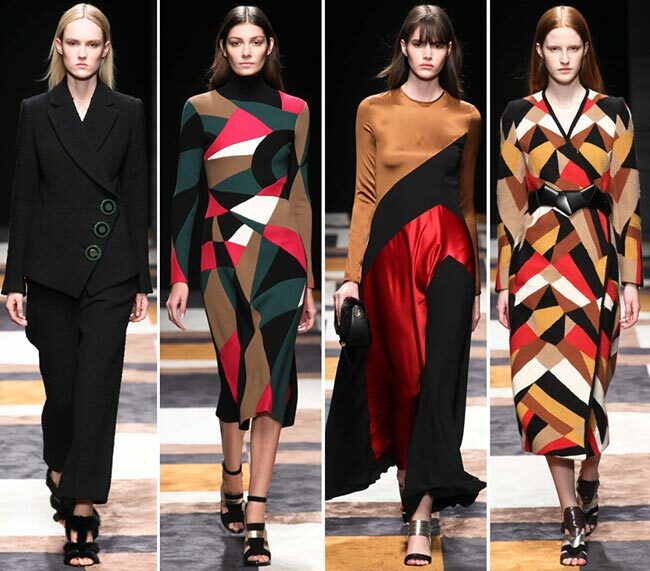 All these ideals had been tweaked though, given a dose of new vitality while focusing on more tactile fabrics and different surface textures, such as the one asymmetrical stained glass color block knit dress with each color section either ribbed, smooth or waffle textured. Ponchos we covet always, particularly with the corrugated horizontal weave that gave the fabric the bounce and movement that would look perfectly appealing on any woman. 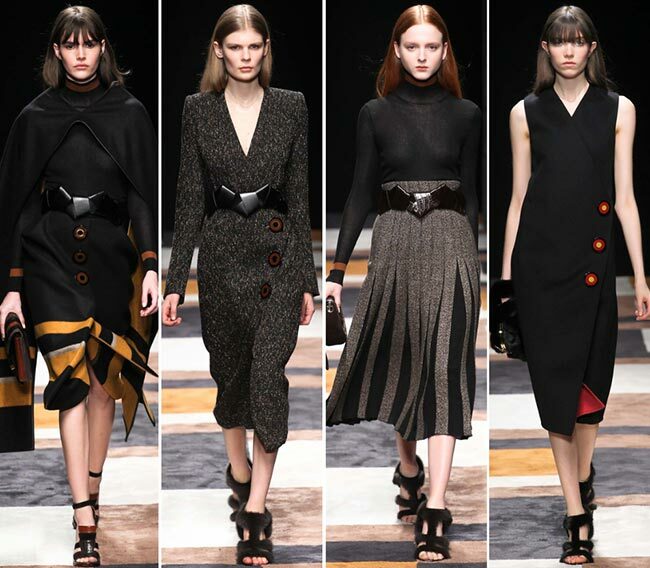 It is quite easy to imagine how the line-ups will form as the fashionistas strive to get their hands on the incredibly beautiful pieces from the Salvatore Ferragamo fall/winter 2015-2016 collection in stores and online, and we are just as captivated by the presentation on the catwalk. One of our favourites is actually the red lace two piece dress with the zigzag leather belt and the long sleeves, complemented with a turtleneck and thigh slit, under which the slinky pleated fabric appears, keeping the skin shown to a minimum with the midi hem of the dress and a sliver of it showing through the shoulders and arms of the garment’s lace fabric. The leather booties matched the belt, while the satchel bag also came in a matching color and texture. 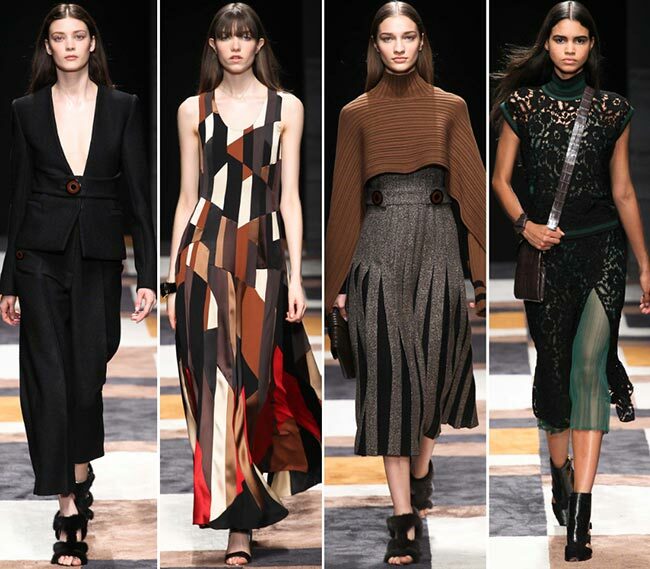 There is everything to love about the pieces that were presented on this runway.